Learning how to do things faster is a big part of life. When you do things faster, often times it means you get more done. And that does not exclude the time when you are using a computer. 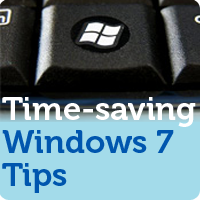 Here are five time-saving Windows tips for those of you using Windows 7 to speed up your PC experience. If your computer isn’t able to keep up with your button mashing of keyboard shortcuts, there’s no point in even knowing them. Something we can’t stop stressing here at FCM is taking maybe an hour a week or less to just fine tune your computer so it’s up-to-date, well-greased and running. That way, as you do your work, your computer is not lagging behind and you will save the potential heartache of losing information or data because of a crash or freeze. In case you missed it, check out our article on maintenance tips to speed up your PC for more help with your PC maintenance. ALT + TAB = Lets you scroll through all the applications are open. CTRL + C = Whatever you have highlighted with your cursor can then be copied later on. CTRL + V = “Paste”ing lets you write out whatever was copied before with CTRL + C. This is invaluable and has no limit in length. WINDOWS + D = Minimizes everything, and pressing it again brings it back up. WINDOWS + E = Brings up an explorer. There are many more shortcuts, but these are my personal favorite and they are useful and versatile across-the-board. Microsoft Windows has followed in Apple’s footsteps by adding a button much like the Apple button present on Mac keyboards. The ‘Windows’ button has a lot of functionality as far as keyboard shortcuts that save time while you use your computer. Microsoft provides a more extensive list of Windows 7 keyboard shortcuts on its website. If you’re more focused on performance than the aesthetics of your machine like me, you’re all about optimizing. This includes using any available software tools or enhancement opportunities to your advantage. Even if it doesn’t seem like much, you feel like you have to do it anyway. This includes things such as: using ReadyBoost, changing your themes to classic, making your background static, disabling special effects, and leaving about 20% of your hard drive free. The colloquial term of ‘wiping’, deleting everything and starting over. If at any point you do choose to “start over,” it helps if you partition your hard drive into 2 sections, one of which would contain your operating system while the other stores all of your other personal files, installed software and other data. I used to have a roommate who would format his computer about once a year or every other year. At first I thought it was foolish, but I did use his computer a lot and the speed different is noticeable. While it may seem a bit extreme to format your Windows PC to save you time, it could help extend the life of your computer in the long run. Do you use the same programs every time you get on your machine? Do you visit the same sites? If so, then take a little time to make things easier for yourself. Customizing your Windows PC experience will pay off big time and help you keep organized as well as make things more efficient and faster. Use quick launch buttons that can dock on your toolbar, so that they’re easier to get to. Use toolbar bookmarks and appropriate browser plugins (such as Fastest Fox and Fast Dial) to find content and get to your favorite sites faster. Use lighter software applications that are less resource-intensive, such as foxitreader instead of adobe reader, or perhaps try Google Chrome or K-Meleon instead of Firefox/Internet Explorer. Also, to save you time with your computer maintenance tasks of disk defragmenting and disk cleanup, try our Free Computer Maintenance software. It takes care of disk defrag, CHKDSK, and Disk Cleanup on an automated, hands-off schedule. With Free Computer Maintenance you can spend more time using your computer (and enjoying the performance benefits), and less time performing the maintenance yourself. It’s completely free of charge so sign up today!